﻿ Designing for Dialogue: How do we design buildings and on-line systems or people to talk, learn and make decisions together? How do we design buildings and on-line systems for people to talk, learn and make decisions together? Tom Worthington, argues that the same buildings discussion.and on-line systems used for education can also be used for wider public discussions. 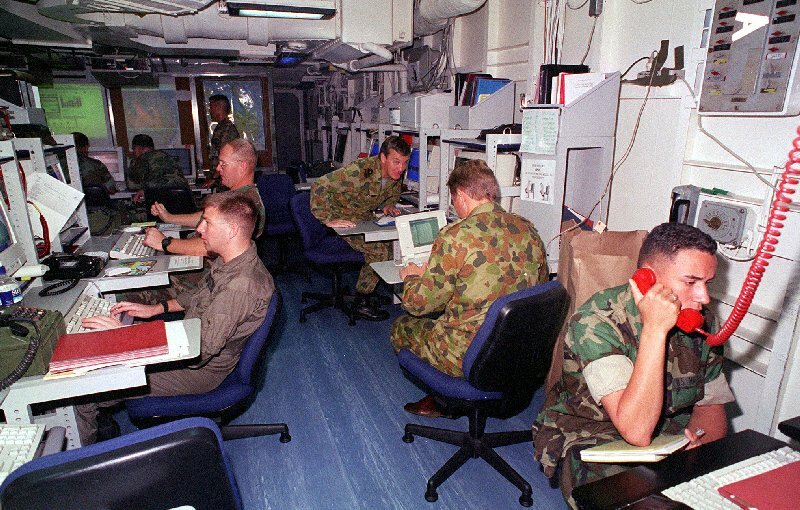 One of the more unusual learning facilities Tom has used is the Joint Command and Control Centre aboard the USS Blue Ridge, flagship of the 7Th Fleet. In 2008 I visited Delphi in Greece. 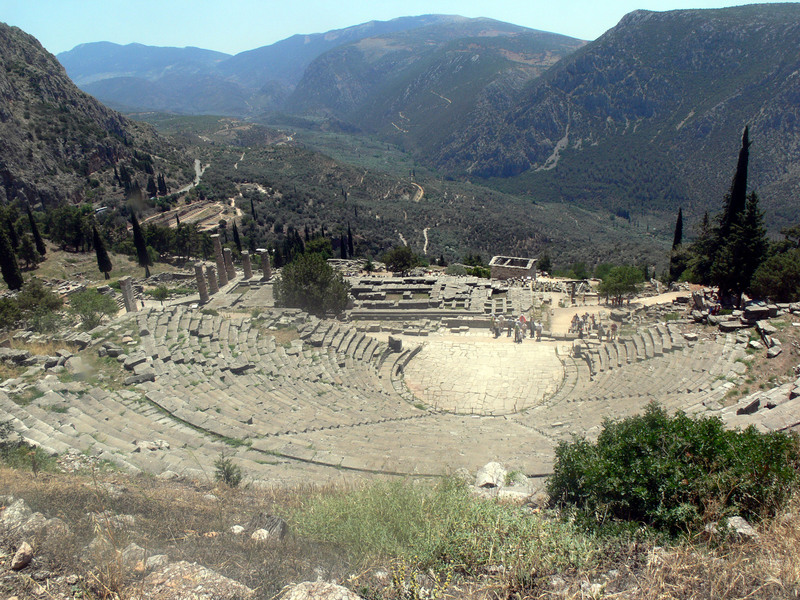 Ancient amphitheatres such as the theatre at Delphi have the same shape and proportions as modern university lecture theatre and discussion forums, such as the Asia Pacific Hall of the Morris J Wosk Centre for Dialogue, Simon Fraser University, or the Harvard style rooms at ANU which Bar Camp is being held in. The curved stepped design of these rooms is required to allow a large number of participants to not only see a speaker at the centre, but also each other. At a less well known location about 1 km down hill from the Theatre of Delphi, is the gymnasium. 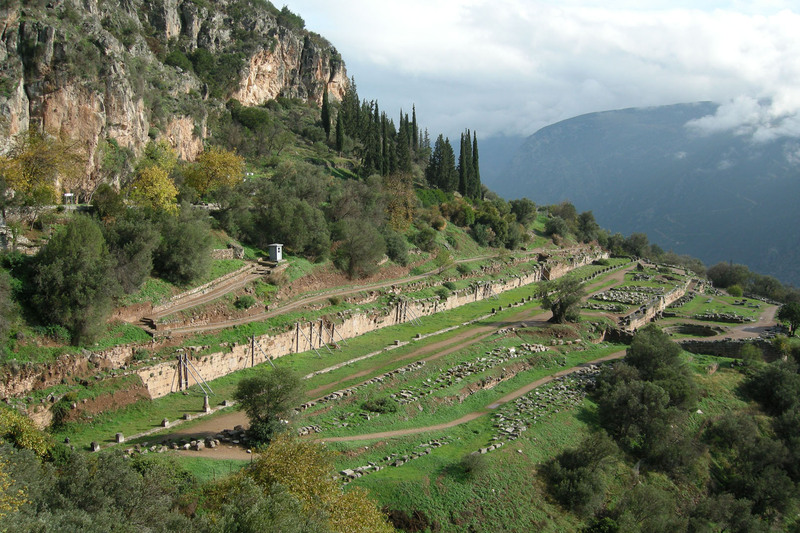 This has a flat exercise area, some old olive trees, and what was a covered walkway(stoa) carved into the hillside. This was where the ancient philosophers did their teaching, sitting in the stoa, discussing the students going past. On returning to the Australian National University (ANU) I noticed the opposite my office at ANU there is a modern gymnasium, with a covered walkway outside and a Cafe. The lecturers meet to discuss educational issues here much as they would have done in ancient Greece, watching the students go past. This area performs a function as important as the formal lecture theatres, providing a place for informal interaction. 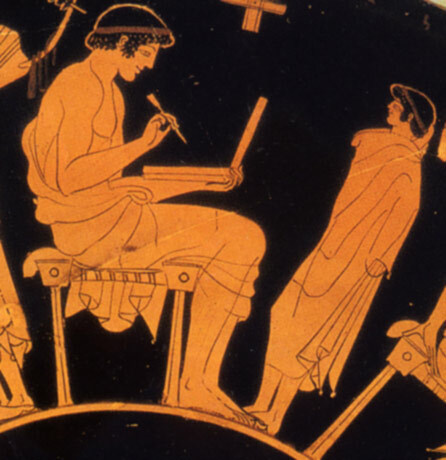 Designs such as the University of Canberra opened a new Teaching and Learning Commons and new $72.4 million Gungahlin College can be used for buildings providing a venue for discussion of issues of public importance, as was done in the ancient world. At the same time the on-line systems developed for education can also be used for dialogue. Propose a learning and dialogue centre for Canberra, also called a "Library". Royal Roads University (Canada), is constructing a Learning and Innovation Centre building. One floor will be a "Centre for Dialogue" for community discussions. This is intended to carry out a similar function to that of the Wosk Centre at Simon Fraser University. However unlike the Wosk centre, which is essentially a conference centre with very specialised discussion rooms for face to face interaction, the LIC building will be primarily a teaching centre for traditional lectures and computer meditated communication, with dialogue as a secondary role. This will allow the facility to be used much more intensively and thus provide the community with a better return on its investment. 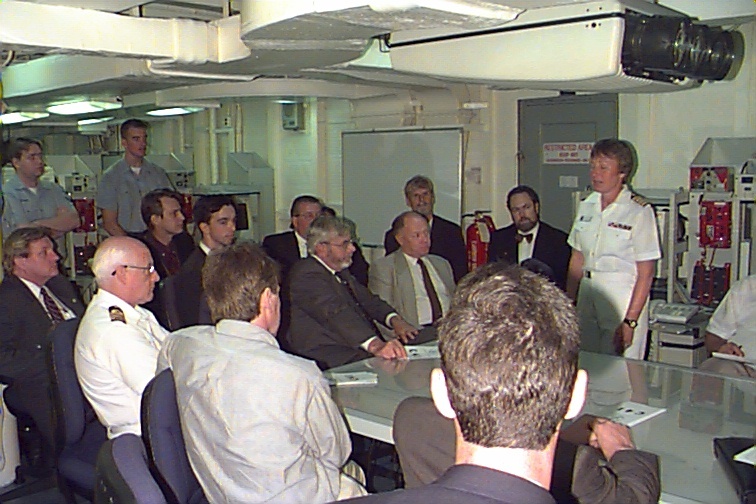 The "Australia Forum", is a proposal from the Canberra Business Council for a venue in Canberra for meetings, dialogue, cultural events and occasions of national importance. There is a Scoping Study available for the project. This complements the Australian National University's "Australian Centre for Dialogue Project". There is a Vision and Mission Statement (PDF) and a brief explanatory movie. The Australian facility would be modelled on the Wosk Centre. In 2007 an architectural competition was held for the design of a proposed $26M (later $30M) "Centre for Dialogue", to be a building built in Canberra. The Australia Forum is proposed to be a new propose built building, located in parkland, in the parliamentary triangle, adjacent to the National Library of Australia. This would provide similar national symbolism to the House of World Cultures Berlin and the Zappeion Athens. Designing for Dialogue: How do we design buildings and on-line systems or people to talk, learn and make decisions together? by Tom Worthington is licensed under a Creative Commons Attribution-Noncommercial-No Derivative Works 2.5 Australia License.